Kleopatra fascinates me more every time I read something about her, though I've never actually read a book that focuses solely on her. 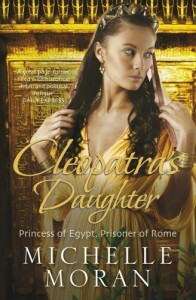 In this book she's described as an extremely strong woman, who rules her people fairly and loves passionately. In ancient Egypt women can be as powerful or more so than men, which is a winning point for that culture in my opinion. We're thrown right into the action surrounding the defeat of Marc Antony by Octavian and as such don't get to see much of Kleopatra herself before she commits suicide, which I was a bit sad about. Three of Kleopatra's children, Kleopatra Selene, Alexander Helios and Ptolemy (the twins' younger brother) are then transported by sea to Rome. Ptolemy dies on the way there and this leaves Selene and Antony, who also fear for their lives, especially after hearing two of their half brothers are killed by Octavian. Octavian doesn't actually seem to want to cause them harm, as long as they're not a threat to him. He sends them to live with his sister and they go to school along with his daughter, nephew and the son of his wife. They're given the same privileges as the others and slowly adjust to life in Rome, Alexander faster than Selene. Selene has a passion for sketching, architecture in particular and upon learning this, Octavia (Octavian's sister) persuades Vitruvius, the architect, to make her his apprentice. Selene was a very likeable main character, she feels passionately about her birth country and is extremely loyal to her brother Alexander. She's smart and cares about other people and what she feels to be injustice. Though she can be quick to judge people, but she's only fifteen at the end of the book, so how much wisdom can you really expect? I felt for her in her unrequited love for Marcellus, Octavia's son. I half expected him to fall in love with her, but this didn't happen and I think she found a better match for her in the end. I felt the ending was a bit rushed and I would have liked to see her realizing who was really right for her a bit more detailed and gradually, it seemed weird somehow now, even though I had been thinking she should end up with him for a while. One thing that bothered me: in the title they spell Kleopatra with a C, and I don't get this, since in the book Selene mentions being annoyed at a woman getting it wrong and spelling it with a C instead of a K.
I was shocked at what happened near the end of the book and so sad! This is a book I couldn't put down, it was so wonderful, shockingly violent and anxiety-inducing! My obsession with Ancient Rome is renewed and I would love to learn more about Kleopatra as well. This is one for the historical fiction lovers among us!